I loved this one so much. The photo disappointed me (especially the out of focus and overexposed flower in the top left), but it was gorgeous in person. Plus there's sort of a white-tie tuxedo thing happening with the labellum. The closest I got to a jaw-drop moment from the 2015 orchid show was the black Paphiopedilum (Black Cherry x sukhakulii) I showed you last June, but I also really liked the Papilionanda Erika Cizek Dann from October, and this Phalaenopsis. I don't know whether it means anything that my favorite orchids from the show were all much darker than the typical varieties. Maybe I was just in a dark purple mood that day. 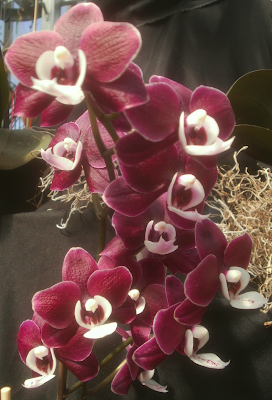 Either way, this is one of the few Phalaenopsis varieties I've seen that I actually covet. Phal. schilleriana is pretty consistently lavender/pink in photo search results (e.g. ); Phal. Malvarosa Valentine Pearl doesn't seem to show up in searches (you get results, but they're all pictures of Phal. Kaoda Twinkle). Heh. We got a mix of NOID phals at work some two months ago. Incidentally two of these were in the mix. Obviously I bought one since it was so different from the rest. Heh. What a stroke of luck to see it featured in PATSP. Heh. This is the first time one of my NOIDs turns out to be a named cultivar. I can't stop going 'Heh'. Anthurium no. 0516 "Brooke Enhart"